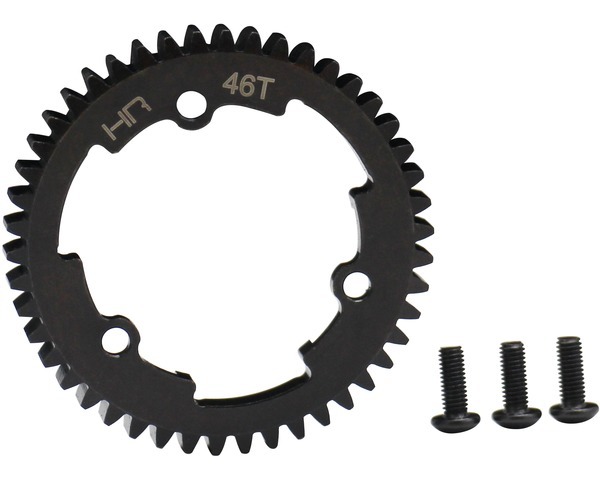 Hot Racing 46 tooth hardened steel Mod 1 (1.0 metric pitch) spur gear for the Traxxas E Revo2, X-Maxx 6S and 8S, and XO-1. - With the pins removed, use the four 4x16mm button-head cap screws on the bottom to set gear mesh. Loosen the four 4x16mm button-head cap screws. Cut a narrow strip of notebook paper and run it into the gear mesh. Slide the motor and pinion gear into the spur gear. Tighten the four 4x16mm button-head cap screws, and then remove the strip of paper. You should be able to run a fresh strip of paper through the gears without binding them.